The monograph Legal regulation of the bodies responsible for financial and fiscal control in Romanian law incorporates a number of significant issues relating to all public bodies which contribute directly or which only facilitate the achievement of financial activities by means of which the financial policy of the state is applied, providing relevant information both on the Ministry of Public Finance (The Agency for Fiscal Administration, The Central Tax Commission, Tax Inspection) and on the Court of Auditors. 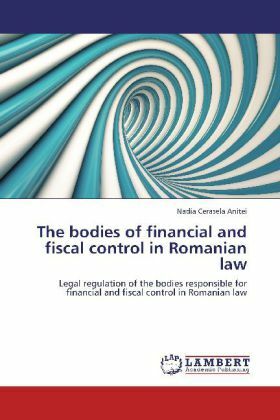 Also, the work provides important information on the bodies with financial and fiscal control responsibilities, as well as important information on the incidents in terms of the competence of the financial and fiscal control bodies. The monograph is divided into a number of ten chapters which are in turn divided into sections and paragraphs.